My long-term goal is to build a complete sectional N-gauge model railroad layout, built upon a theme of Japanese rail. This layout will contain various types of electronics to support operations and some special visual effects. 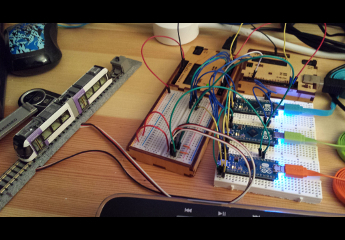 To develop and test out these electronics, my short-term goal is to build a “breadboard” tram line which will act as a testbed for these designs. The tram line will be built on three custom-made modules framed in thin plywood with layers of extruded polystyrene as a carvable surface. These modules were originally prototypes for the full layout, but for now I have re-purposed them for this project. 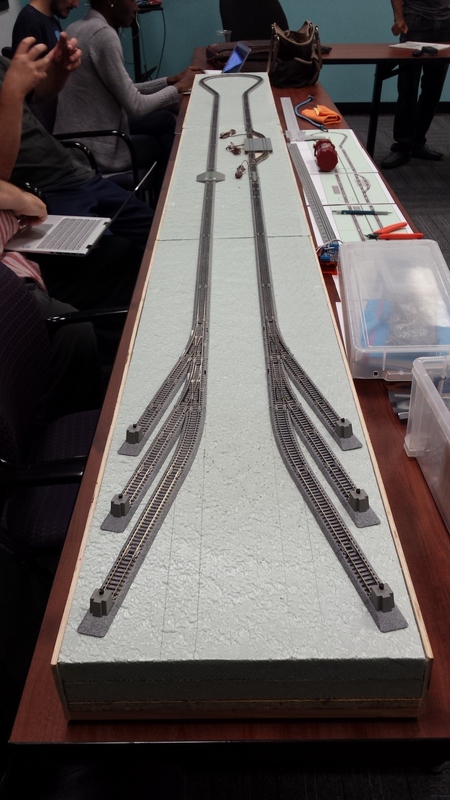 The track is (almost entirely) KATO Unitrack, which is the same type of snap-together track that our club (Japan Rail Modelers of Washington DC) uses in our display layouts. The electronics are primarily based upon various forms of Arduino microcontrollers, with sensors and interface components obtained mostly from Adafruit and SparkFun. The Toyama Light Rail line is located in the city of Toyama, the capital of Toyama Prefecture in Japan. The line runs mostly north-south, with the south terminus on the north side of Toyama-eki-kita (the north entrance to Toyama Station) and the north terminus at Iwasehama, in the port section of Toyama. The Iwasehama station is about a ten-minute walk from the shore of Toyama Bay. The line runs 7.6 km (4.7 miles), mostly single tracked with four stops double-tracked to allow trams going in opposite directions to pass each other. The trams themselves, nicknamed PORTRAMs, are articulated electric trams. The Toyama Light Rail has seven such trams, each one white with a different color stripe pattern. Below is a short clip of PORTRAM TLR 0602 (orange) pulling into the south terminus at Toyama-eki-kita, recorded during my visit to Toyama in May 2015. I currently have a collection of seven N-gauge models of the PORTRAMs, pictured below. 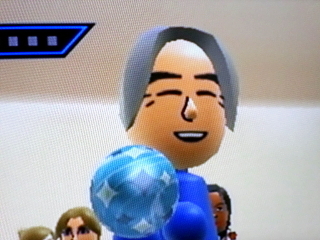 Five are made by KATO, and the other two by TOMIX (the pair at the bottom). 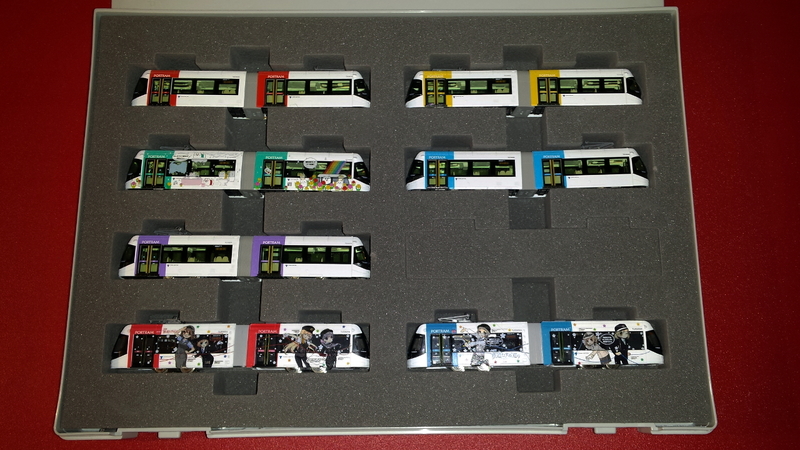 The TOMIX units were bought mostly for the “wrapping” artwork on them, but don’t run as well as the KATO units. 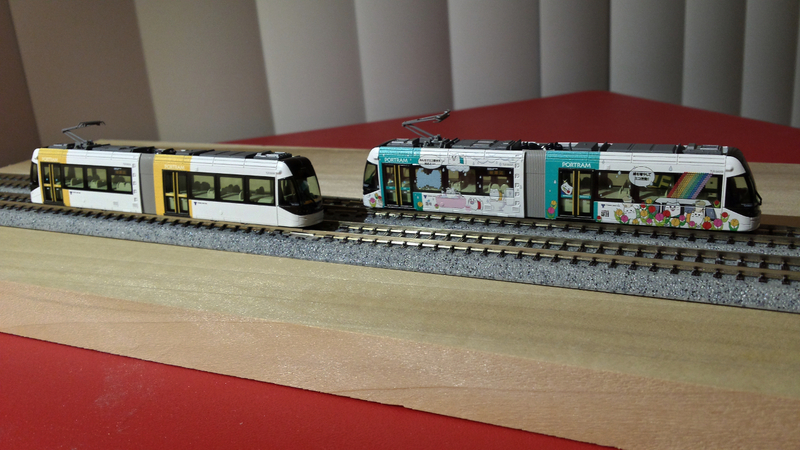 So for this project, I will be using only the KATO trams. Each of the three modules is 992 mm long and 300 mm across. (992 mm is the length of four KATO 248 mm straight track sections joined end-to-end.) The track will be an elongated U shape with the two termini side by side, with a visual barrier between the legs of the U. Each terminus will end with three stubs, thus requiring two turnouts at each end. There will be two tram stops, one on each side of the U. The tram stop on the upper leg will be a double-tracked passing section with spring-action turnouts, like those used on the prototype PORTRAM system, so that trams arriving at the stop will always take the track to their left. The platforms for riders traveling in opposite directions are across from each other (not shown in the plan but marked). This section of track, outlined in blue, contains the only track pieces that are not KATO Unitrack; they are TOMIX Fine Track because only TOMIX had the very compact turnouts I wanted. The tram stop on the lower leg is of the type used by most of the Toyama Light Rail tram stops. They usually appear at crossings for vehicles or pedestrians. A tram making a stop passes through the crossing before stopping at the platform beyond, letting off and taking on riders on the left side of the tram. So in the diagram above, assuming up is North, the platform to the right of the grade crossing is for eastbound trams, and the other platform is for westbound trams. The three stubs at each terminus are a bit of overkill, since the south terminus on the Toyama Light Rail has only two, and the north terminus only one. But I might hide one or both termini in my full layout inside tunnels, and the turnout control circuit I have in mind will support two turnouts per control, so I figured, why not? This way viewers might see one tram disappear into a tunnel heading off to farther stations… and later a different tram could exit the tunnel, as if the trams passed along the way. I haven’t yet decided where the boundaries between track blocks will be; I’ll update the track plan once I narrow those down. Here’s a picture of the first time all the track was placed on the modules.